What had once been an ancient shoreline of Lake Michigan, mired with swamp and sand dunes, is today the town of Dyer. Its history consists of the old Sauk Trail-turned-highway, strong-willed and hardworking visionaries such as Aaron Hart who drained the swamps and created farmlands, entrepreneurs who developed the early businesses and established Dyer as a town in 1910, and events such as the arrival of the locomotive and automobile that altered the lives of its citizens and shaped Dyer into the populated and bustling town it is today. 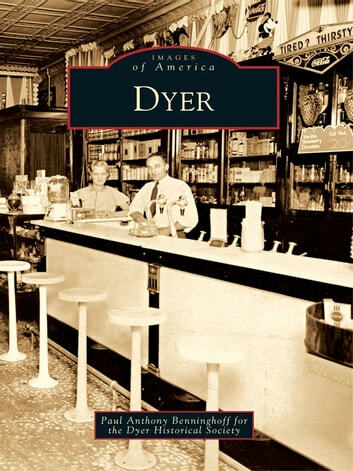 From a sleepy farming community to a distant suburb of Chicago, the town of Dyer has a history both rich in its own right and very much tied to American history. One will see how a small American town unique to its geological location is impressed onto the land and how influences by events unfolding beyond its borders can help create, and sometimes jeopardize, its identity.